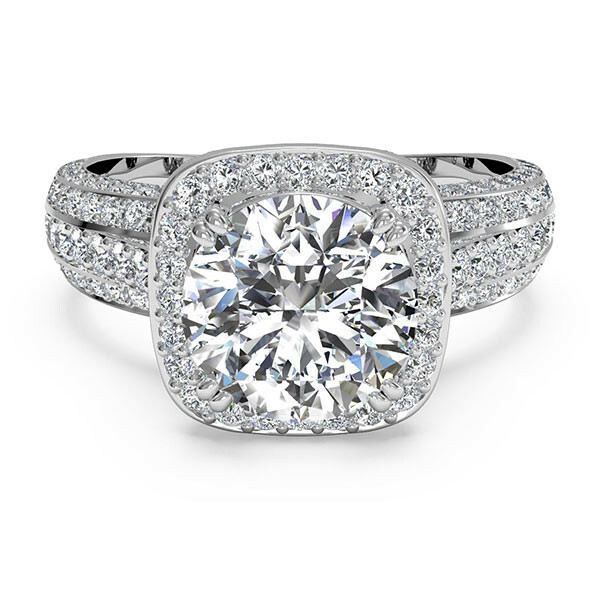 This brilliant engagement mounting is from the Ritani Masterwork collection. Crafted in 14kt white gold, it will surround your round center diamond in a cushion-shaped halo. This focal point will rest on a triple band with pave diamonds. These small gems are also presented beneath the setting, delivering beauty from every angle. The setting is also available in 18kt white, yellow or rose gold, as well as platinum precious metal. This engagement mounting has a rich and brilliant look.